Liverpool city centre streets were taken back in time as dozens of actors and film crew took over the roads outside the town hall for a period drama. Horse-drawn cabs passed back and forth outside the town hall along High Street, while passersby stopped to watch the filming taking place, and take their own pictures. 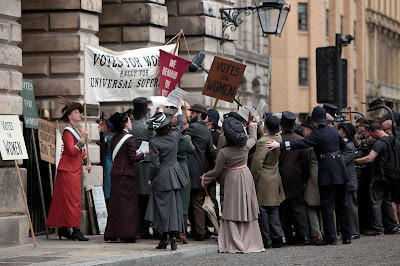 The actors, dressed in Victorian-style costume, were mostly gathered just outside Liverpool town hall, which had a new brass sign proclaiming it to be the “Home Office”, while there were banners calling for “Votes for Women”. New street furniture was placed around the town hall while the road was covered in grit, hiding the modern street markings. Among the gallery of pics is this shot credited as: "A cast member takes a break during the filming of Houdini & Doyle outside Liverpool Town Hall." But look closely. Could this be Stephen Mangan as Conan Doyle? You can view more images at the Liverpool Echo website. 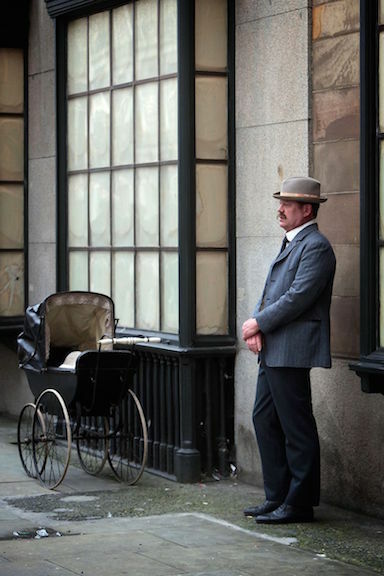 Houdini & Doyle stars Michael Weston as Houdini and Stephen Mangan as Sir Arthur Conan Doyle. The series will air in 2016 on ITV Encore, Global TV, and FOX. Great pics. So far, so good. The crowd photo is really great. Check out the cameramen on the right.